I saw this recipe on one of my favorite blogs, Can You Stay For Dinner?, and I had to share. I love the idea of mixing your breakfast together the night before with a few simple ingredients, putting it in the fridge then voila, you have breakfast when you wake up. The only mistake I made was using Steel Cut Oats instead of Old Fashioned Rolled Oats…use the rolled oats, it will result in a less chewier experience! 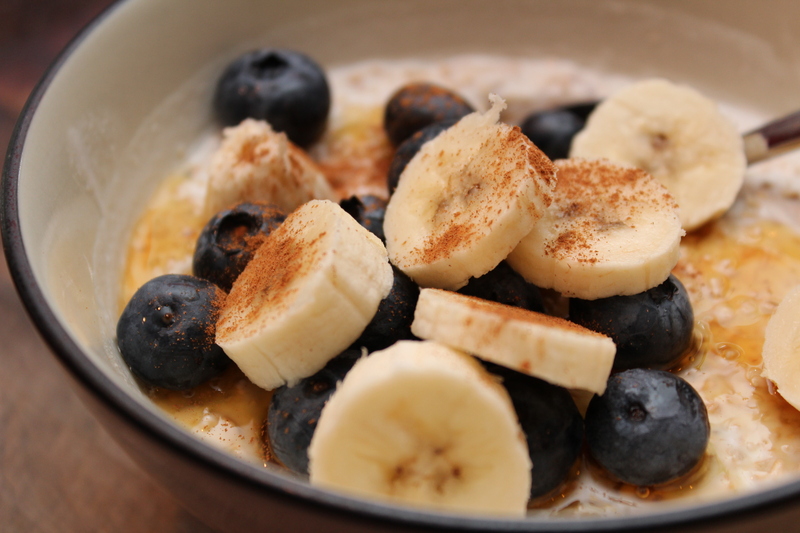 When I pulled the oats out of the fridge the next morning I just topped them off with a drizzle of honey, blueberries, a sliced banana and a dash of cinnamon! Delish! At night (before bed), mix all ingredients well in a small bowl. Cover and refrigerate overnight. In the morning, stir and serve. No need to heat them, no need to dirty another bowl. Simply mix in your desired toppings. I went with honey, blueberries, banana, and cinnamon! I love this one – so simple and absolutely delicious! Thank you. ive never mixed yogurt and oatmeal! Me neither. The honey and cinnamon really helped to add that extra hint of sweetness.